Ethereal , ephemeral, shifting light. 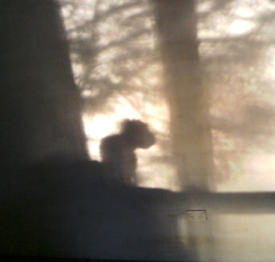 The tree outside my bedroom window filters the first rays of the day. It lasts for a very short time , perhaps ten minutes or so and only during winter- such is the angle of the sun. It also reminds me of images made by a pinhole camera- the fixing of the shadows without overt detail .